I can’t stress enough the importance of saving for college. If you have little ones that are making their way through the traditional K-12 education ranks, it is a good idea to start a college savings account right away. Some experts state that the best time to start a college savings account is even before your children are born. However, the realist in me recommends shortly following their birth or kindergarten to start that education savings. You can start out with a simple savings account at any bank with money provided from Christmas and Birthday cards and later make the decision to formalize the college savings by rolling it onto a 529 savings plan or something similar. The key thing is to start sooner versus later because if you think the cost of education is high now… just wait until your future high school junior/senior starts looking at their college options years from now. In addition, having a college savings plan in place for your children will definitely be more encouraging as they consider whether a college education is the right path for them. If having a quality education isn’t convincing enough, the College Board states that the median family income in 2008 for those with a bachelor’s degree or more was $101,099, compared to $49,414 for those with just a high school diploma. The numbers speak for themselves. 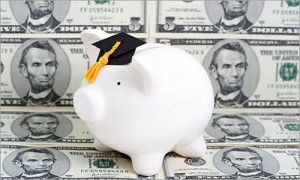 If you are curious about the different vehicles in which you can save for college, don’t hesitate to check out our guide to college savings provided by CheapScholar.org Contributor Phil Laube, a CPA from Ohio. He provides comprehensive descriptions of the different options you can choose from to save for college and he also shares some great links to other sites for additional information. Originally started by the College Savings Plan Network, more than 40 states have declared September “College Savings Month.” Section 529 plans make it easy and affordable for the average family to plan ahead for the cost of college attendance and are available in 49 states and the District of Columbia. In fact, the 108th Congress of the United States officially recognized September as College Savings Month in 2003. Across the nation, many activities are held and communications sent out to recognize the importance of saving for college during the month. CheapScholar.org included!